The knowing of our being--or rather, awareness's knowing of its own being in us--is our primary, fundamental and most intimate experience. It is in this experience that the peace, happiness and love for which all people long reside. The happiness we have sought so long outside of ourselves, in situations, objects and relationships, turns out to be always present and available in the simple knowing of our own being as it truly is. The knowing of our own being shines in each of us as the experience 'I am' or 'I am aware', or simply the knowledge 'I'. This obvious, familiar and intimate experience has no objective qualities and is, therefore, overlooked or ignored by the majority of people. This overlooking of our own being is the ultimate cause of unhappiness. What is the nature of the experience of being aware or awareness itself? The exploration of this question is the subject matter of this book and the essence of the Direct Path to peace and happiness. The Essence of Meditation Series presents meditations on the essential, non-dual understanding that lies at the heart of all the great religious and spiritual traditions, compiled from contemplations led by Rupert Spira at his meetings and retreats. This simple, contemplative approach, which encourages a clear seeing of one's experience rather than any kind of effort or discipline, leads the reader to an experiential understanding of their own essential being and the peace and fulfillment that are inherent within it. 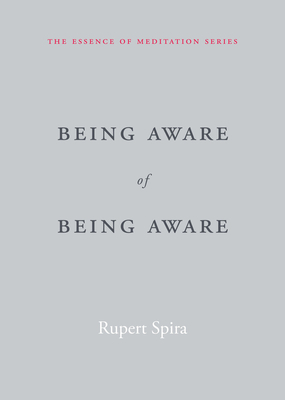 Being Aware of Being Aware is the first and introductory volume in The Essence of Meditation Series. From an early age, Rupert Spira was deeply interested in the nature of reality. At the age of seventeen he learned to meditate, and began a twenty-year period of study and practice in the classical Advaita Vedanta tradition under the guidance of Dr. Francis Roles and Shantananda Saraswati, the Shankaracharya of the north of India. During this time, he immersed himself in the teachings of P. D. Ouspensky, Krishnamurti, Rumi, Ramana Maharshi, Nisargadatta, and Robert Adams, until he met his teacher, Francis Lucille, in 1997. Lucille introduced Spira to the Direct Path teachings of Atmananda Krishna Menon, the Tantric tradition of Kashmir Shaivism (which he had received from his teacher Jean Klein), and, more importantly, directly indicated to him the true nature of experience. Spira lives in the UK and holds regular meetings and retreats in Europe and the United States. For further information, see www.rupertspira.com.